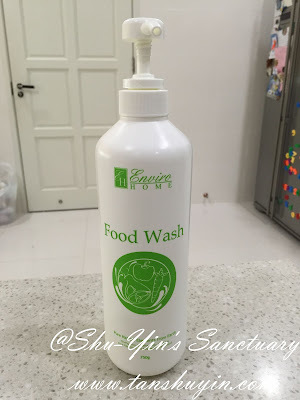 Shu-Yin's Sanctuary: Review & Giveaway: EnviroHome - An Eco-Friendly Choice for a Happier and Healthier Family! Review & Giveaway: EnviroHome - An Eco-Friendly Choice for a Happier and Healthier Family! 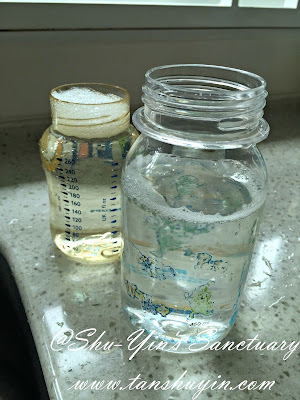 I'm always looking for natural and safe products for my family, so I was happy when I was contacted by EnviroHome to review some of their products. 'An Eco-Friendly Choice for a Happier and Healthier Family' is EnviroHome's mission. EnviroHome brings us a series of quality personal care and household cleaning products that are chemical-free and made of 100% natural ingredients. Their products are safe, non-toxic, strong, effective, reliable, economical, and environmentally friendly. I like that they believe in caring for the environment, as much as caring for our family and home. And that is the reason why the products are 99.9% biodegradable. By using their products, we are also joining them in maintaining the natural ecological balance. They have a few ranges of products, from Personal Care range, Household range, and Baby range. It came in a big brown box. I must say that the packaging can be improved. The box is a little too big for the contents inside. And the empty space should be filled up with more recycled papers/foam or such, so that the products/bottles won't be tumbling all around the box, which may cause leakage from the bottles. These are the products sent to me by Envirohome. In the Household range, I received the Food Wash. 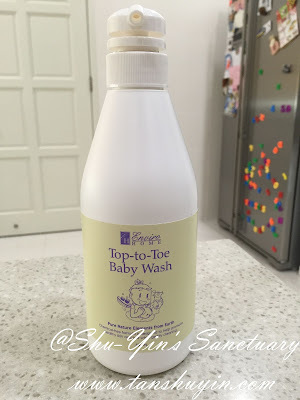 In the Baby range, I received the Top-to-Toe Baby Wash, and Baby Bottle Wash. I heard that their Food Wash is their best selling product, and I must say I agree fully, because this is also my favourite product of theirs! 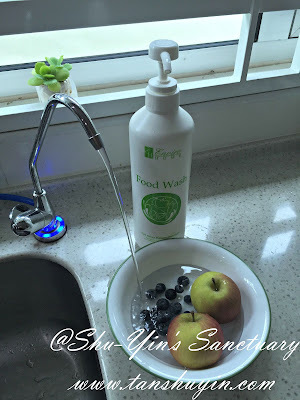 This Food Wash doesn't contain any chemical ingredients, but breaks down the pesticides, wax, insecticides, bacteria, preservatives and others, by reducing the original form of vegetables and fruits with non toxic and 99% biodegradable formula. I use this a lot to wash fruits for my family. 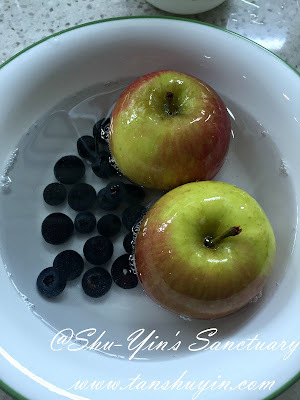 I have small kids at home, and my youngest loves to eat fruits. So he eats some fruits almost every day. Just pump a little on a basin/bowl of water and then soak it for a few minutes. I also give it a little rub to remove the wax or whatever more effectively. I love to see how after a rinse and a little rub, the whitish thing on my grapes always come off, it is like magic to see! I also use it to wash raw vegetables, especially when I make salad. It is important to wash off the pesticides from the food when you eat it raw. Watch how clean and so much greener the broccoli is after using the Food Wash, and how the water could kinda 'penetrate' through the broccoli after that. Another thing I use is to wash my rice with it too, to remove the layer of wax on my rice. 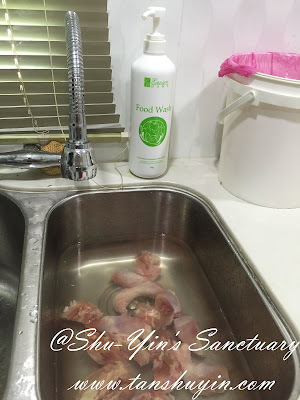 However, this food wash is not only for vegetables and fruits, it can also break down the bacteria and fishy smells from seafood and raw meat to preserve the freshness. So when basically, when I handle any raw food, I will use this very useful Food Wash to wash them. As with all the other products in EnviroHome, this is also made from natural products. It uses mineral salts and sea water extract, and a special blend of botanical ingredients to remove milk stains, dried or leftovers from baby food naturally. 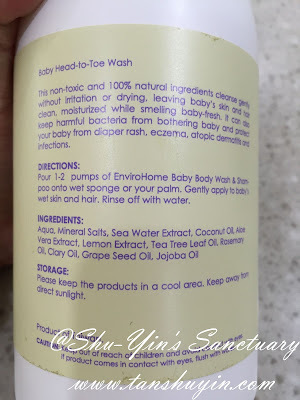 I was glad to know that this is also a hypoallergenic product, so very suitable for sensitive baby skin. Below is the ingredient list. I use it to wash the milk bottles and also the water bottles of my kids' water bottles, almost every single day since I got this Baby Natural Bottle Wash.
And at times when I feel 'hardworking' I will also use it to wash some of their toys. It is easy to remove the oily milk stain, just as well as any other normal washing detergent. I also found out that it also effectively remove the odour of the soured milk, especially when the milk is unfinished and left overnight. It foams just a little less though compared to the normal washing detergent, but nevertheless it works as well. 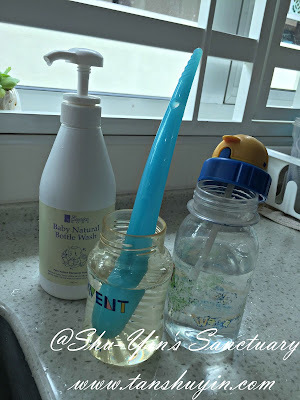 It also works well in washing baby's utensils, like their forks and spoons and plates, etc, especially if you have a sensitive skin child, as it is also a hypoallergenic product, and will not cause unnecessary skin irritation to your child. 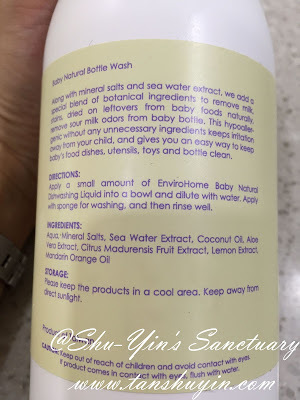 This is a gentle enough formulation even for newborns and babies' sensitive skin. 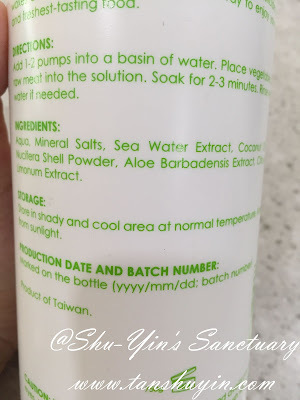 It is made from a cleansing complex featuring mineral salts, sea water extract and coconut oil. Please see below for the ingredient list. Both my kids love love love bath time. Sometimes it may be a little hassle when calling Khye to go into the bathroom. But once he is in, it is very difficult to call him out. So he spends quite some time in the bathroom playing with the shower and toys. Luckily the weather is really hot these days, so it is a good way to cool my kids down. And as usual, I love these top-to-toe washes coz it simplifies everything when showering my kids. 1 wash for the whole body. It washes quite well, and leaves a pleasant very mild scent. It washes the hair well even after an outdoor activity, leaving no more sweat smell or whatsoever. The only thing I noticed is that after washing their body with it, it leaves a 'sqeaky' kinda feeling as if it is 'over clean 'til it squeaks'. I'm not sure if you understand me but the sqeakiness feeling on my hands need some time to get used to it. After a week or so of using it, I barely noticed it anymore. But that was what I felt initially. Another thing is that it takes quite a lot of washes to wash away the 'soapy feel' on the body/hair compared to the other brands I've been using. Not sure if this is a good thing or not. Good perhaps so that I wash the kids more thoroughly the. "_"
All in all, I love EnviroHome products, especially their Food Wash, which I'm definitely going to purchase it once I finish my bottle. They provide our family with a healthier choice and also gives us peace of mind. I am pleased to announce that EnviroHome is sponsoring below to SIX lucky winners! Giveaway ends on 8th July 2015 (Wednesday) 11.59pm Malaysian time. The winners of the Food Wash are Lim Shehfen and Yu Meiyi. 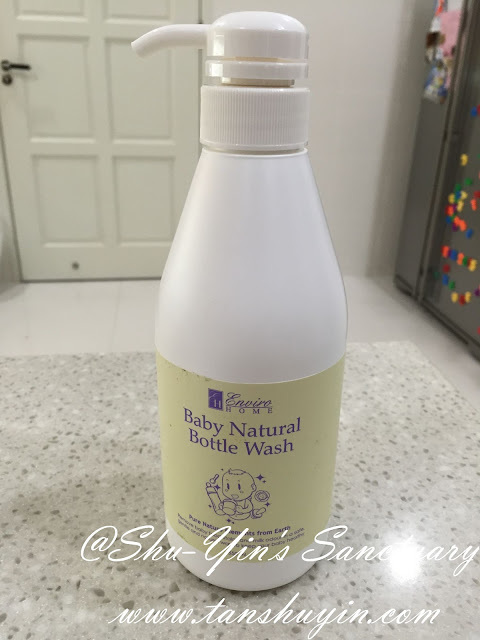 The winners of the Baby Natural Bottle Wash are Py Yvonne Wee and Grace. The winners will be receiving an email from EnviroHome on how to collect the prize(s) soon. The every so generous people from EnviroHome is going to send samples to ALL PARTICIPANTS of this giveaway! All of you who participated should be receiving an email from EnviroHome soon! You can purchase them at EnviroHome Website. Or you can also visit their Facebook Page for more info. Envirohome is having a Special Thanks Promotion from now until 31 December 2015! So what are you guys waiting for? Go get a bottle or two of the Food Wash, and some of the other products are great too! p/s - My mum loves it too, and she 'stole' half a bottle of my food wash to her house! 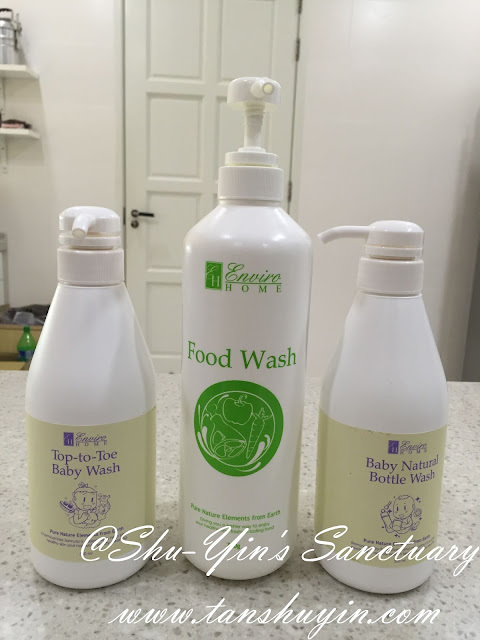 * Disclosure: I received a bottle of their Food Wash, Baby Natural Bottle Wash, and Baby Top-to-Toe Wash each for review purpose, but no monetary incentive was received. All text and opinions are of my own and represents my honest opinion of the product(s).